This article will help you take the guess work out of buying Frozen Lobster Tails. 9 chances out of 10 if you are thinking lobster tails, it's probably for a special occasion. You want the best there is and you want it to come out perfect. But where do you start? To improve your odds of cooking that perfect lobster tail, let's start with buying the best lobster tail. You're always ahead when buying good quality frozen lobster tails. First there are two types of lobster tails. You have Warm water and Cold water tails. I would bet that most lobster tails that you will find will be warm water. This is mainly due to the price, as they are cheaper than cold water tails. Now I'm not saying you won't find cold water tails. But I think you would have to go to a good fish market, a high end grocer or buy lobsters online. Warm water tails mainly come from Florida, the Caribbean, and Latin America, while the cold water tails come from South Africa, Australia and New Zealand. 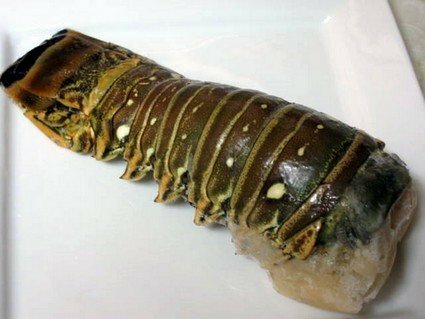 The picture below is a warm water lobster tail, still frozen, with just the right amount of ice glaze to protect the meat. Con: Higher chances of getting a bad tail (a lot of people say there is a 1 in 5 chance when purchasing a warm tail that is will be mushy after cooking, or it will have an ammonia odor or it can firm up but fall apart on you when eating eat). Con: Excessive glazing; some processors will inject water into the tail usually between the meat and the shell for extra protection for freezer storage. This adds weight to the tail so you are paying for water instead of lobster. Con: Tails can be soaked in Sodium tripoyphosphate. This helps preserve the frozen tail longer in storage and it does add weight to the tail. Read the label if buying a package product or ask the person helping you if it has sodium tripoyphosphate in them. Try to not to buy lobster tails that have sodium tripoyphosphate. Now just because it seems the cons out weigh the pros, warm tails are still a good buy and can be good eating when you know what to look for when buying. Pro: Because of the cold water they grow in, these tails will be tender and have a whiter meat and I think are much sweeter. Con: Can be harder to find locally but readily available online. Con: The price is considerably more than warm tails. Avoid buying tails that have any discoloration in the meat such as black spots or yellowing. Tails should not have any grayish. Don't buy thawed lobster tails. Tails need to be defrosted properly and cooked right away. Look for what I call smaller tails, ranging from 6oz to 12oz. These are the prime of lobster tails. Buy from a reputable place.